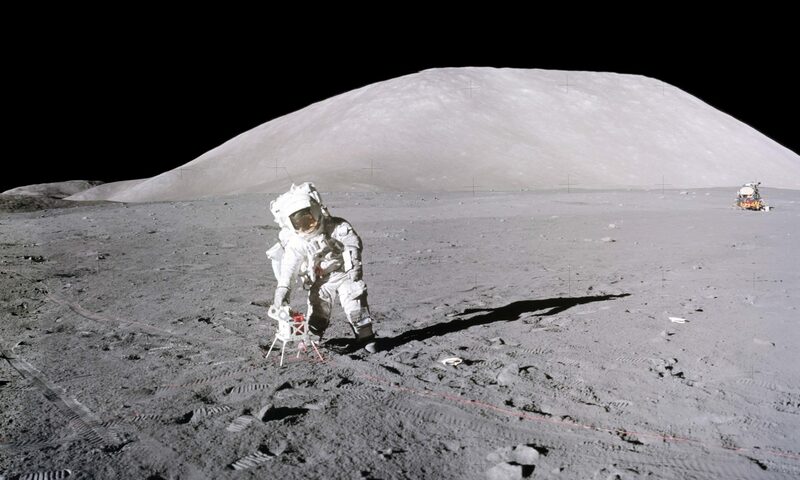 Harrison H. (Jack) Schmitt was the last of 12 Apollo Astronauts to set foot on the Moon in December 1972, a geologist whose professional background was indispensable for exploring the Valley of Taurus-Littrow, the landing site of Apollo 17. That skill was particularly evidenced by his on-the-spot field analysis of the origin of the house-sized broken boulder on the slopes of the North Massif, and by his discovery of orange-colored soil at Shorty Crater. The orange soil turned out to be pyroclastic glass, a chondritic volcanic material from a depth of around 500 km (300 miles), which had not changed in chemical composition since the origin of the Moon. This orange soil was not just localized to Shorty Crater. Jack’s crewmates, Ron Evans and Gene Cernan, both spotted orange soil patterns around a number of other craters from orbit once they knew what to look for. Moreover, support geologists at Mission Control also later discovered more orange areas in some of the earlier Apollo 14 orbital photos while Apollo 17 was still circling the Moon. These observations have a profound impact on theories of the origin of the Moon because they indicate that the Moon’s interior composition has changed little since it formed. Theories of formation that include complete re-melting of the interior, which would alter that chemical composition, can therefore be excluded. Thus, drawing on his experiences as a field geologist, Jack found a clue confirmed at the time by others he instructed that is fundamental to our understanding of the Moon’s origin. Now, 33 years after his mission, Jack has similarly drawn on that lunar geological experience, as well as his practical knowledge of NASA, industry, government, and teaching, to write a book astonishing in the breadth covered by its 14 chapters, each with references and endnotes for those wishing to pursue cited topics further. No one interested in the practical application of going back to the Moon and on to Mars can afford to miss reading this exposition. The book is an outgrowth of course lectures that Jack gave at the University of Wisconsin-Madison (UWisc) over several years, the last series in the Spring of 2004, but since brought up to date and expanded considerably. His students must have really enjoyed attending those classes because he is a great lecturer! The basic premise is the establishment of a permanent lunar mining colony as a private commercial enterprise to process and ship Helium-3 (He-3), the light isotope of regular helium gas (He-4), back to the Earth to fuel fusion reactors for the production of electricity. He-3 is carried in the solar wind, which is deflected from the Earth by the geomagnetic field. However, it has been impinging on the lunar surface for the entire history of the Moon where it becomes embedded in the soil particles (regolith), constantly overturned by micrometeorite bombardment. Jack explains how these mostly pollution-free fusion reactions work in terms easy to understand, and their significance to the global economy. He devotes an entire chapter to the difficulties of He-3 fusion power production, describes successful fusion reactor experiments at UWisc (obtaining He-3 for research is only possible at present by purchasing it at $1000/gm from the U.S. or Russia as a by-product of tritium processing for nuclear weapons), projects the costs of building a 1000 MWe fusion power plant, and assesses the likelihood that such plants can be built. He provides another chapter on determining the concentrations of He-3 in various areas of the Moon and estimates that there are about 2,500 metric tonnes derived from highest concentration soils in the first 3 meters of regolith from 84,000 sq. km of Mare Tranquillity alone, the lunar plain where Neil Armstrong first landed. Armstrong brought back particular soil samples that contributed to this determination. To this estimate can be added about the same quantity from soils of medium concentration over an area more than double that in the same Mare. The average regolith depth in Tranquillity, however, is 6 meters; thus, there is potentially about 10,000 metric tonnes of He-3 extractable from this one region of the moon. One metric tonne (2200 lbs) is worth about $1.4 billion in coal equivalent power estimated for the 2010-2020 time frame. That’s 14 thousand billion (14 trillion) dollars worth of He-3 power available from one area of the Moon! The present U.S. electrical power consumption costs roughly $40 billion a year. Thus, there is not only a monetary incentive to bring this He-3 back to the Earth; but there is also enough of it to provide our energy needs for at least 350 years! Another way of looking at these figures is that 100 kg of He-3 would power a 1000-MWe fusion reactor for over a year. Ten such reactors would supply enough electricity for a city of 10 million for that period. That is 1/3 the population of California, or 1/6 the population of the U.K. The Mare Tranquillity output would thus supply that city with electrical power for 10,000 years!! Other areas of the Moon have lower, but not insignificant concentrations of He-3. However one slices the He-3 pie, can we as a nation, as a society, as a civilization really afford to ignore the potential global implications of vigorously investigating the economics of lunar He-3 mining? That is the core message contained in “Return to the Moon”. But the book covers much more than He-3 mining. It essentially spans the entire period of U.S. space exploration from Eisenhower’s establishment of NASA in 1958 and his order to construct the Saturn V heavy booster through today’s problems faced by Mike Griffin, the current NASA Administrator, who read a draft of the book prior to its publication. And Jack pulls no punches. Chapters 9 and 10 are a Tour de Force. Chapter 9 treats the lessons Apollo taught us, and where we went wrong in the post-Apollo period. Chapter 10 is an annotated collection of lengthy emails with the current White House’s first Administration (primarily the OMB) on how NASA should be restructured and why. He points out that NASA and the U.S. public in general have become too risk averse, which can lead to stagnation and ultimately to stopping human space exploration altogether. He also takes NASA to task for having ignored biomedical research proposals on humans in space as seriously funded endeavors with the National Institutes of Health and the Food and Drug Administration. He explains in detail the kinds of experiments that were done in the past and their significance, but that NASA basically took an “air sickness” approach to any problems that astronauts manifested (when they admitted to having problems). He also discusses what kinds of medical problems need further examination. Jack even advocates that he and his remaining fellow Moon walkers should be subject to thorough targeted autopsies because little is known of the effects of breathing in Moon dust laden with glass! Such effects need to be clearly defined before establishing a lunar settlement. Jack also does not ignore other energy sources on how an expected worldwide 8-fold (conservative estimate) increase in energy demands by 2050 should be met. He provides detailed comparisons, relative costs, and the relative merits of the most significant of these, including nuclear fission vs. fusion power production. The latter discussions are most informative in showing how the U.S. lost its leadership role in the generation of nuclear fission power to France and Japan, and how the U.S. still erroneously considers all nuclear waste (spent nuclear reactor rods) as “waste” when at least 90% of it is recoverable. People who run businesses at any level will enjoy the business acumen that Jack displays throughout the book. The core financial analyses are not just simple calculations, but rather detailed cost estimates of the various components needed to guarantee a successful return to the Moon with justifications for each choice. One of these is a new launch vehicle that Jack refers to as the “Saturn VI”, which should have the capability of putting a 100 metric tonne payload on the Moon, twice that of the Saturn V booster. He suggested its specifications using the Saturn V as a benchmark. Interestingly because it is derived from the prior technology, Griffin himself has referred to the new launch system and CEV (crew exploration vehicle) that NASA plans to adopt for its projected return to the Moon as “Apollo on steroids”! In addition, Jack covers the legal issues of lunar mining, managerial problems, and how big projects should be organized. He also compares the cost-efficiency of 6 different models of achieving a self-reliant He-3 mining colony, ranging from an all-government approach to private enterprise. Once a commercially viable lunar colony has been established, the economic returns governed by the colony products and the worldwide distribution of power on Earth will serve to form a more stable civilization, one view of humankind’s manifest destiny that ought not be overlooked. There are a number of books on the market today advocating colonization of the Moon and travel to Mars, but Jack is one of only nine remaining authors who can truly say: “been there, done that”. His book not only proves that, but by drawing on that experience it also justifies his privilege of having walked on the Moon. That may very well turn out to be the true legacy of Apollo!